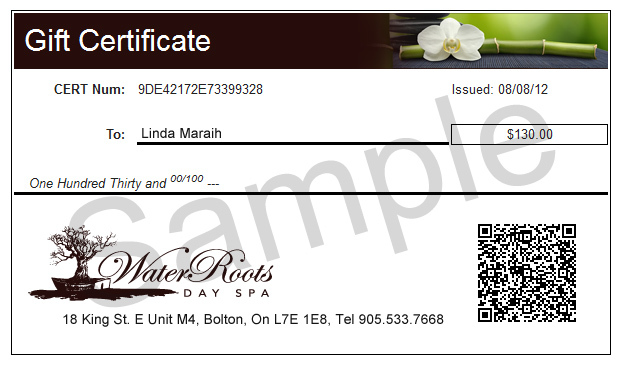 $ Not sure what to give?Enter a dollar amount to be redeemed towards any Water Roots treatment. Unused portions will be credited towards future visits. $110 Nourishing Lavender PolishDiscover a sense of serenity, exfoliate and remove impurities while an aromatic calming oil nourishes skin with Lavender and Chamomile essential oils, easing muscle tension. $180 Black Pepper Slim & DetoxHelp Remove body toxins, discourage water retention and tone the look of “orange peel” skin. Experience a delightful slimming synergy with our ultrasonic massager followed by an exquisitely warm seaweed wrap.